Is Elk Grove midday sign waver a sign of things to come on SCOTUS with a Justice Kavanaugh? Will the confirmation of Brett Kavanaugh as the newest member of the U.S. Supreme Court breath new life into one hot-button issue in the social wars that was seemingly resolved? 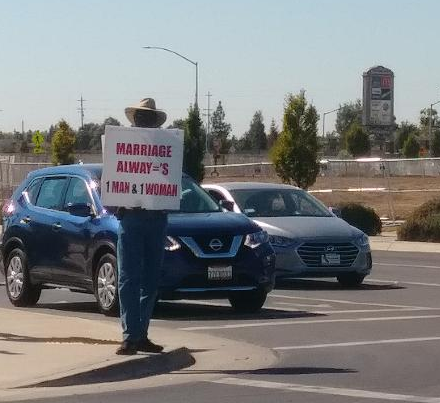 Midday today, a sign waver was seen on the corner of East Stockton Boulevard and Sheldon Road in Elk Grove. The man displayed a sign that was anti-marriage equality that proclaimed, according to him, marriage is reserved for one man and one woman. From our memory, the last time we spotted such signs was during the contentious battle over California's infamous Proposition 8. Is it a coincidence this person started waving his sign against marriage equality just as Kavanaugh was elevated to the Supreme Court? Even though the issue was seemingly resolved three years ago with the U.S. Supreme Court's decision in Obergefell v. Hodges, there has been wide speculation that social conservatives want to resurrect the issue. This, of course, is being done in an environment where most American's are more open-minded about marriage equality. Now with Kavanaugh on the bench after replacing Justice Anthony Kennedy, who coincidentally wrote the majority opinion in Obergefell, don't be surprised to find out that schemes are being hatched by an assortment of evangelicals and conservative legal scholars across the country. As he did during his confirmation hearing on any number of divisive social issues, Kavanaugh was vague on marriage equality during questioning by Senator Kamela Harris. Off course some people speculate, hope, that Chief Justice John Roberts might fill the role the court's swing vote. Reader's may recall that it was Robert's, not Kennedy's vote that upheld the Affordable Care Act. As the Chief Justice with a court bearing his name, many speculate that Robert's is cognitive of his legacy. After all, if he stripped existing rights away from a class of people, his legacy would be comparable to that of infamous cases such as Dred Scott or Plessy v. Ferguson. While one guy standing on a corner in some bland California suburb does not mean an unraveling of hard-fought civil rights is imminent. Nonetheless, the sentiment expressed should not be dismissed either.